If you’re in the market for a new pickup truck, don’t miss out on the completely redesigned 2019 RAM 1500. It has been improved from the ground up. Not only does the latest RAM 1500 benefit from a larger cabin, but it also introduces a number of new advanced safety technologies. Cool styling makes the new RAM 1500 even more exciting. Every driver can take advantage of the truck’s higher towing capacity. Your local RAM dealer serving Amityville Westbury Huntington Long Island NY invites you to come take a tour of this pickup! To find out which new truck dominates the competition, check out this 2019 RAM 1500 vs 2019 Ford F-150 comparison. Both of these trucks prove to be capable hauling and towing machines. However, the new RAM 1500 has some key advantages on its side. 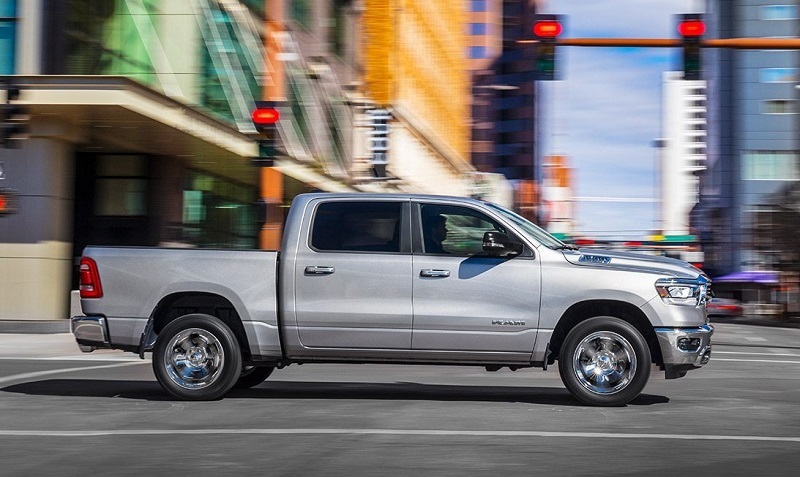 Only the RAM 1500 can be equipped with an exclusive Active Level Four-Corner air suspension. This dynamic suspension adjusts to the weight of your load, which makes towing a lot easier. However, the Active Level Four-Corner air suspension is more than just a one-trick pony. When driving on the highway, it automatically lowers the truck to improve stability and reduce wind drag. Unfortunately, you can’t get this exclusive upgrade on the Ford F-150. If you have any questions about how the available air suspension works, be sure to contact your dealer serving Amityville Westbury Huntington Long Island NY. 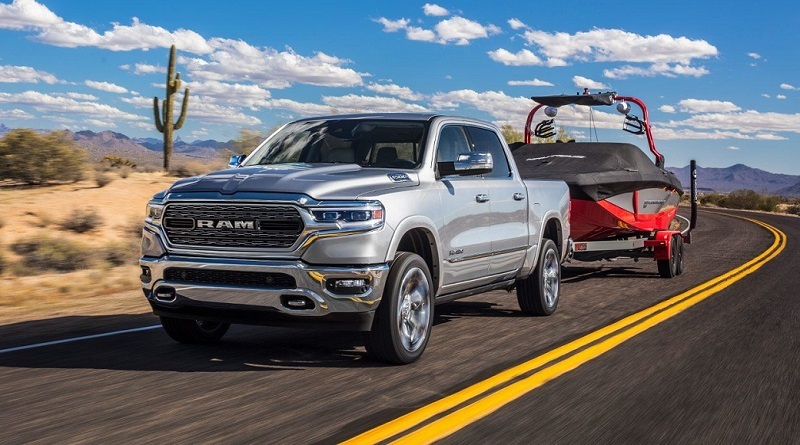 If you enjoy being behind the wheel of a fun vehicle, the 2019 RAM 1500 is destined to leave you impressed. When test driving the new RAM 1500 at your local Security RAM dealer, you’ll have two great engines to choose from. Even the base Pentastar V6 packs a healthy 305 horsepower and 369 pound-feet of torque. An eight-speed automatic transmission comes standard throughout the lineup. For the drivers who need more muscle under the hood, RAM offers a Hemi V8 engine. It’s rated to develop a monstrous 395 horsepower and 410 pound-feet of torque. Although the 2019 Ford F-150 also packs plenty of performance, the RAM 1500 is clearly more engaging to drive. You can look forward to experiencing best-in-class handling. When taking curves in the new RAM 1500, you’ll feel extremely confident. Rear coil springs help keep the RAM 1500 incredibly balanced. Don’t expect the Ford F-150 to feel as nimble. The RAM 1500’s superior ride quality gives it yet another edge over the F-150. Whether you’re taking a trip to the mountains or riding around in Long Island New York, look forward to experiencing a great deal of comfort. Don’t hesitate to come take this truck for a spin! Like the new RAM 1500, the 2019 Ford F-150 can be equipped with four-wheel drive. If you’re looking to take a serious off-road adventure, look no further than the RAM 1500 Rebel. It’s specially engineered to conquer the toughest terrain in Long Island New York. To ensure that the Rebel model can overcome challenging environments, RAM outfitted it with a number of special off-road goodies. While skid plats help protect the truck’s undercarriage from rocks and stumps, special shocks help the RAM 1500 Rebel to absorb rough landscapes. Although a one-inch suspension lift comes standard, the optional Active Level Four-Corner air suspension gives you an additional inch of ground clearance. You won’t find this option on the Ford F-150 Raptor. When driving the new Ram Rebel, you’ll be able to easily go from the street to the trails. For 2019, RAM has updated the appearance of its popular full-size pickup. You’ll immediately notice the RAM 1500’s bold front fascia. Striking headlights and a powerful grille help the RAM 1500 to truly stand apart from today’s other pickups. Although the Ford F-150 has an attractive appearance, it doesn’t command as much attention on the road. While some drivers will enjoy the tough-looking Rebel model, others will love the chrome-clad Limited model. The new Kentucky Derby Edition will turn even more heads with its unique bed graphics. Some of the eye-catching exterior colors include Delmonico Red Pearl-Coat, Diamond Black Crystal Pearl-Coat, Blue Streak Pearl-Coat, and Ivory Tri-Coat. 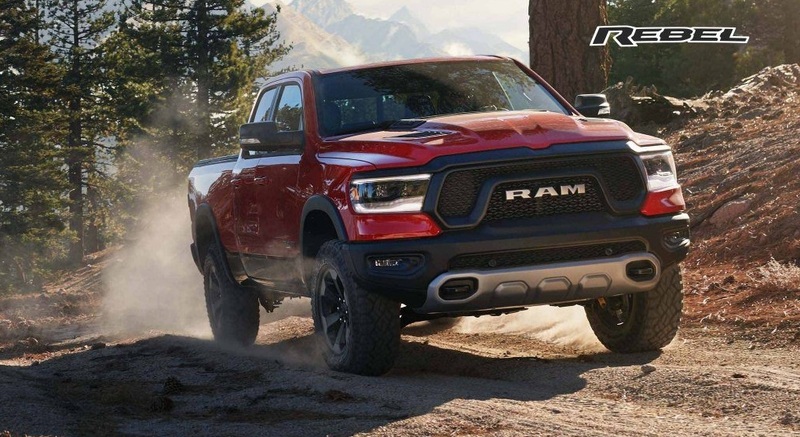 For more details on the RAM 1500’s available appearance upgrades, contact your local dealer serving Amityville Westbury Huntington Long Island NY! No other pickup in Long Island New York offers more passenger comfort than the new RAM 1500. Featuring heated and ventilated reclining rear seats, the RAM 1500 Longhorn rewards your family with an especially relaxing ride. The Quad Cab version of the Ram 1500 is perfect for big families. A spacious backseat gives it a major edge over the F-150 crew cab. Your passengers will have a lot more space to stretch their legs. The RAM 1500’s available high-tech goodies add to its luxuriousness. RAM’s Uconnect interface with Apple CarPlay and Android Auto remains one of the best infotainment systems in the business. If you really want to impress your friends, opt for RAM’s new 12.0-inch touch screen. The F-150’s available 8.0-inch screen doesn’t even compare. You’ll also love the RAM 1500’s Harman Kardon premium audio system, which delivers a class-leading sound quality. As you can see in this 2019 RAM 1500 vs 2019 Ford F-150 battle, RAM’s new pickup is the winner! Security RAM urges you to take a test drive.